When it comes right down to it, bat houses are no different than any real estate — occupancy is influenced by both architectural design and location. Bats are all too often found in sub-optimal roost sites, when nothing better is available. The following suggestions are based on long term research conducted by Fly By Night and data from BCI’s Bat House Research program. The following minimum guidelines are incorporated in to every bat houses we build — we keep the standard high and have declined offers from others to build bat houses for us, but we refuse to put our name on smaller and simpler houses that may be easier and cheaper to build, but lack the quality we are proud of. 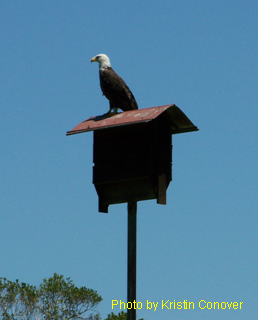 · Research shows bats prefer larger bat houses. Three or more interior chambers are necessary to provide the needed thermal conditions. 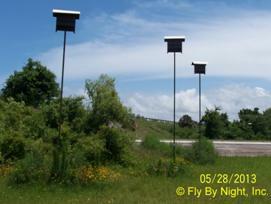 Small single chamber bat houses are acceptable IF mounted directly onto to the side of a structure. Larger spacing increase the potential for mud daubers, wasps and other competition. Larger is always better, avoid tall narrow bat houses with widely spaced crevices. · Research shows that caulked and painted bat houses are more likely to be occupied than bare wood bat houses. Use of a high quality caulking and wood sealer will add years to your bat house and keep the occupants warm and dry. · Roosting substrate is very important, bats have difficulty hanging onto a smooth surfaces. All roosting surfaces should have a rough profile that bats can easily climb on (and reduce the risk of pups falling from the roost). However, our early research revealed significant problems caused by screen failure and we strongly discourage the use of screen or other materials to roughen a smooth surface. Surfaces should be roughened or grooved manually, if possible. · Landing Pad — a 4” - 6” landing pad will make it easy for bats to enter. · Avoid aromatic cedar — the odor may deter bats until the wood has aged.